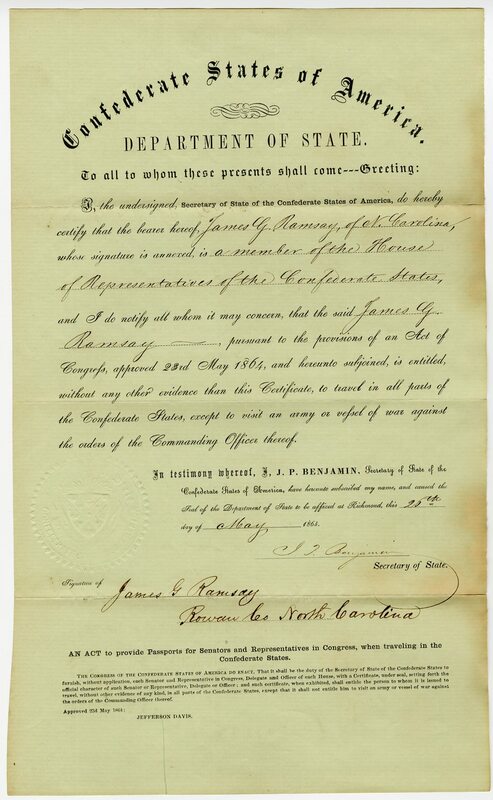 Item Description: Confederate passport issued to James G. Ramsey and signed by Judah P. Benjamin, Secretary of State for the Confederate States of America (1862-1865). James Graham Ramsay (1823-1903) attended Davidson College and Jefferson Medical College in Philadelphia. He practiced medicine in Iredell and Rowan counties, N.C. Ramsay was a Whig state senator, 1856-1864, and served in the Confederate Congress. After the war, he was active in the state Republican Party and served again in the legislature in 1883. Item Citation: Confederate Passport dated 26 May 1864, found in folder 10 of the J. G. Ramsay Papers #1568, Southern Historical Collection, The Wilson Library, University of North Carolina at Chapel Hill. This entry was posted in Southern Historical Collection and tagged Judah Benjamin, passport. Bookmark the permalink.